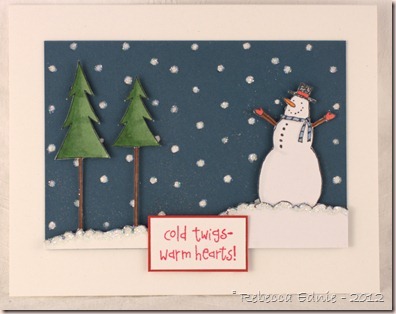 I made this card for an Ellen Hutson WCMD challenge but I failed to blog it and enter it in time. Fortunately, I’ve found someone who can use it and I can be entered for other prizes! Vera Yates is running a card drive for the holiday season for the elderly in nursing homes. Make a winter or holiday card, send it in and it will be entered into a draw for lots of awesome prizes. Check out the details by clicking on the icon above. I used a die to cut out the snowflakes from the blue paper. Then I filled in the holes with glue and glitter. So pretty! I was in a rush when I made it so the trees aren’t Copic coloured as well as I’d like. Oh well. Wow!! this is gorgeous and looks like a lot of work! I love your cute snowman card. Thanks for joining us in weekly challenge at Joan's Gardens.